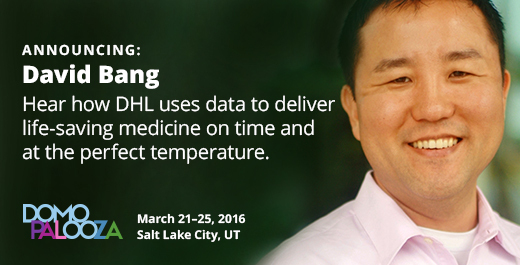 SILICON SLOPES, UT – February 18, 2016 – Today Domo announced that David Bang, CEO of LifeConEx and Global Head of DHL Temperature Management Solutions, will speak on the mainstage at Domopalooza™ 2016. Bang will discuss how data plays a huge role in fueling the visibility and efficiency of LifeConEx’s delicate and precise shipping of temperature-controlled pharmaceutical products. Bang’s focus will be on sharing how his company is reducing risk, elevating return-on-investment and prioritizing patient safety in global pharmaceutical distribution. To learn more about how experts from DHL and other successful organizations are using Domo to get more value from their business data, register for Domopalooza on Domopalooza’s event page.